Someone says Poland, you think 'pierogi'. True, a majority of foreigners associate them with Polish cuisine. But Poland is the home of dozens, if not hundreds, of other dumplings too. "Today it might seem to us that a thing from our own homes is corny and outdated, but let us not forget that it is part of our experience and those notes of flavour, this kind of sensitivity and a special tradition can become our power, and perhaps even a unique style and a philosophy of cooking that has a future." So, are Polish kluski corny? No, they’re a must-eat! And here is a mini-guide to the popular among them. 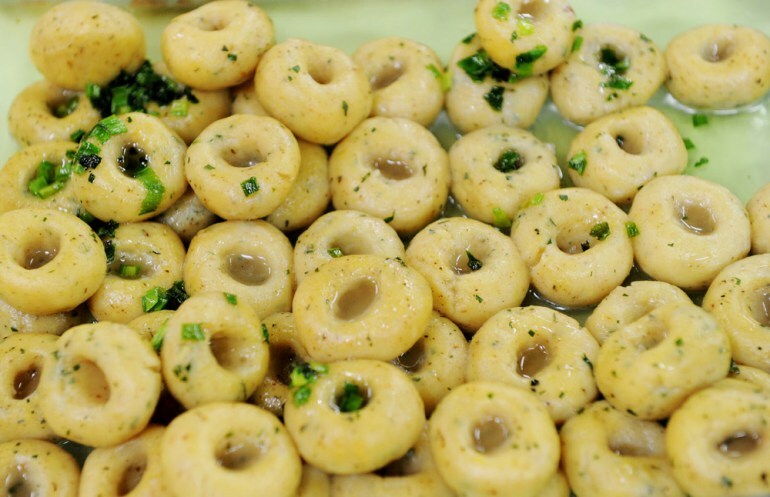 Silesian kluski, which come from the Upper Silesia region, are elliptic potato dumplings with a typical indentation, perfect for holding some sauce. 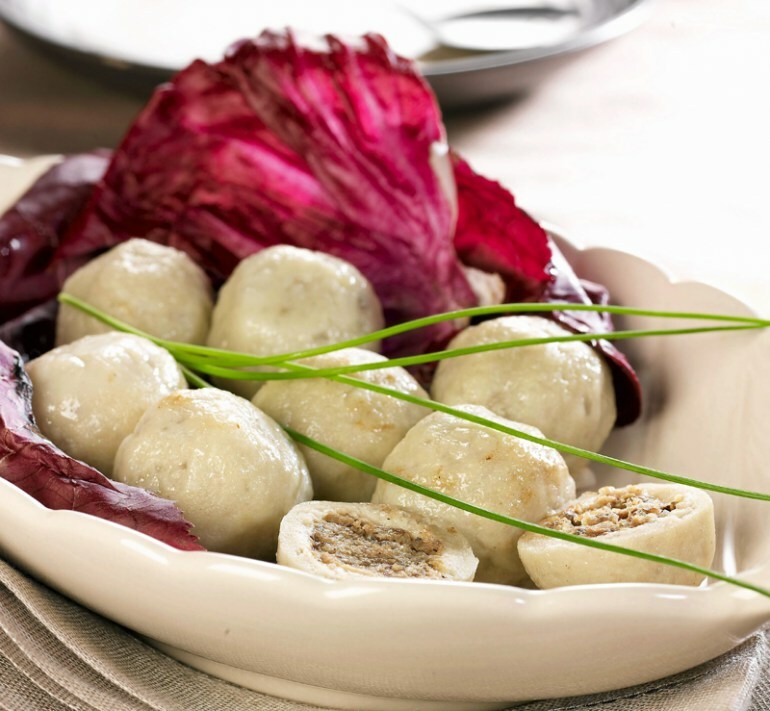 Two varieties of these dumplings are usually made in Silesian homes—white ones and black. The white ones are made with cooked potatoes, and the black—with raw ones. Recipes for Silesian kluski that make up a part of the traditional Silesian dinner are usually passed on from generation to generation. Served with a roast and gravy, they are an obligatory element of family dinners and holiday meals. Up until recently, any wedding feast which lacked this kind of dumpling would have been considered a disappointment. In those areas where German influences mingled with those from the Czech Republic, the kluski gave way to the knedle (pronounced: kneh-dleh). And it was both Silesian and the Wielkopolska region that used to fall under Czech rule, hence why the knedle cuisine is most popular there. The potato knedle are probably the most frequently encountered. The savoury variety is stuffed with meat, cabbage, mushroom, bread and cottage cheese, and served with cream, melted butter, fried bread crumbs or pork crackling. In the summer, knedle are frequently served sweet, with fruit stuffing made of either plums or strawberries. In the 19th century, the Wielkopolska region saw a huge rise in the popularity of potatoes. Poznań and its surrounding territories were a huge potato goldmine. It is thus no wonder that the Poznań cuisine was well-known for the large variety of potato-based kluski—each kind bearing a different name. Today, the most popular kind of dumplings associated with Poznań are the pyzy. These large, rounded kluski are quite similarly made to the Silesian dumplings, and they are also made with either cooked or raw potatoes. But unlike the Silesian kluski, pyzy are almost always stuffed. Their filling can be either meat, cottage cheese, or mushroom-based—with a topping of lard, bacon and fried onion. Yeast pyzy are also popular in Poznań, made without potatoes and only using flour and yeast. These kind of pyzy can be stuffed, but do not have to be. They can be steam-cooked (in this case they bear the moniker pampuchy, pronounced: pam-pooh-khy, aka buchy if the region is Silesia). Poznań yeast pyzy often make up a part of the tradition dinner in the region. How do you make them? Maybe by following in the footsteps of one of Poland’s most famous food bloggers, Eliza Mórawska, who cites a recipe in her book entitled Apetyt na Polskę (Appetite for Poland). 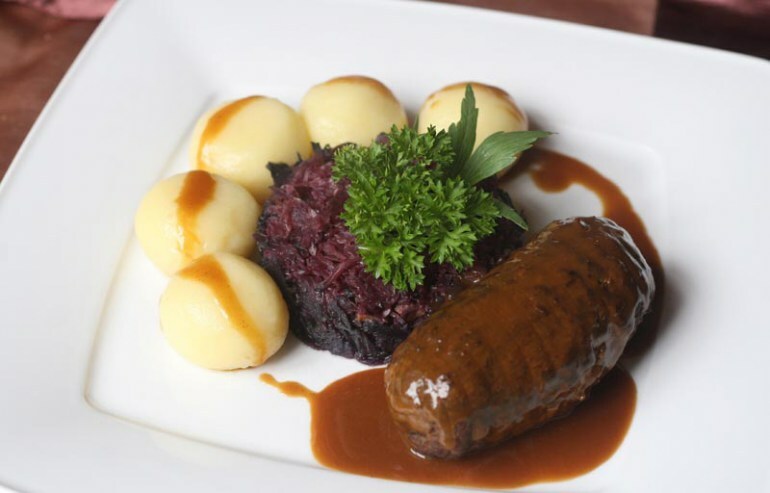 When it comes to Poznań cuisine, it’s impossible not to mention the grey kluski (which have been registered on the list of regional specialities). The boiled kluski are topped with smoked bacon, or with speck and onion. Although they used to be considered food for the poor, today they often accompany even the most gourmet kind of dishes, instead of potatoes. Kartacze arrived in Poland from Lithuania. They are quite simply a compulsory point on the culinary programme of any visit to the north-east of Poland—from the Podlasie region, through Suwalszczyzna to the lake region of Mazury. These highly nutritious and delicious big kluski are made from raw potato dough, much like the pyzy. They are oval-shaped and the biggest kartacze connoisseurs will defy with offence any attempt at comparing them to Poznań's pyzy. Kartacze have to be tender, and the most popular meat stuffing has to be seasoned with garlic. There are also varieties of the kartacze that are stuffed with mushroom, sauerkraut, or cheese. The most wanted and the most popular among kluski eaten in the Tatra mountain range are the hałuski and the tarcioki. Preparing home-made hałuski is simple, yet very time-consuming. The different versions are made with flour and potatoes, but regional restaurants usually serve the potato kind. Traditional góralka (highlander) women first blended the base ingredients, then they made the dough from which they produced rolls, and then, tore off small pieces of the dough which they would toss into boiling water. Nowadays the hałuski are often served with spicy sheep milk cheese called bryndza, or with the usual skwarki. In the east of Poland, similar little kluski are baked and served after fried in butter, and topped with cream and fruit. Tarcioki are elliptic in shape, and their name comes from the action of shredding (tarcie in Polish) raw potatoes from which they are made. 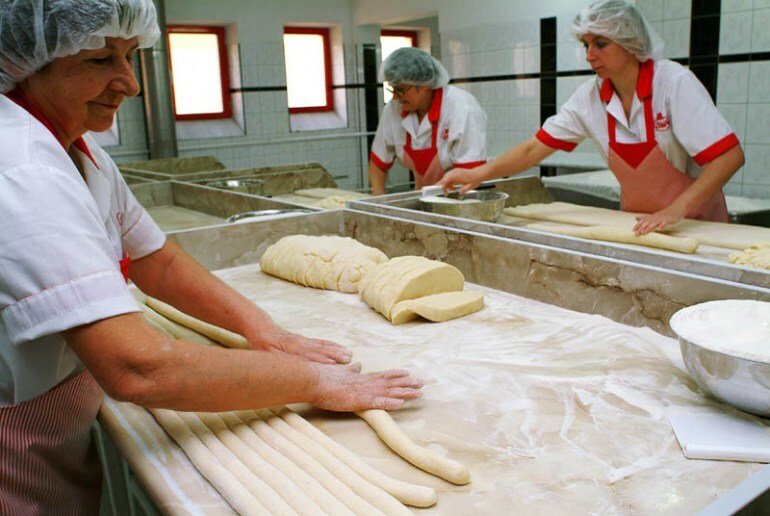 After kneading a firm kind of dough, small, longish kluski are formed by hand. Cooked tarcioki are usually poured over with skwarki. And apart from it… pierogi leniwe and kopytka across all of Poland! The so-called pierogi leniwe (literally meaning lazy pierogi) are a type of kluski which actually have little to do with pierogi. Maybe apart from the fact that the ingredients are the same as in the case of pierogi with cheese—eggs, flour, potatoes and cottage cheese. They certainly get their name from the fact that, in comparison to the pierogi, making them takes very little time, and they have no stuffing. After bringing the ingredients together, the dough is shaped into a fine roll. Then, little rhombic pieces are cut off with a knife and tossed into boiling water. Traditionally, they are served either with melted butter or butter-fried breadcrumbs. Cooks of the young generation, such as Marysia Przybyszewska, (an intern at Copenhagen's Noma), suggest serving the leniwe in a savoury entourage—with special burnt sage and garlic butter. (The recipe can also be found in the Appetite for Poland book, published for the 2015 EXPO fair). 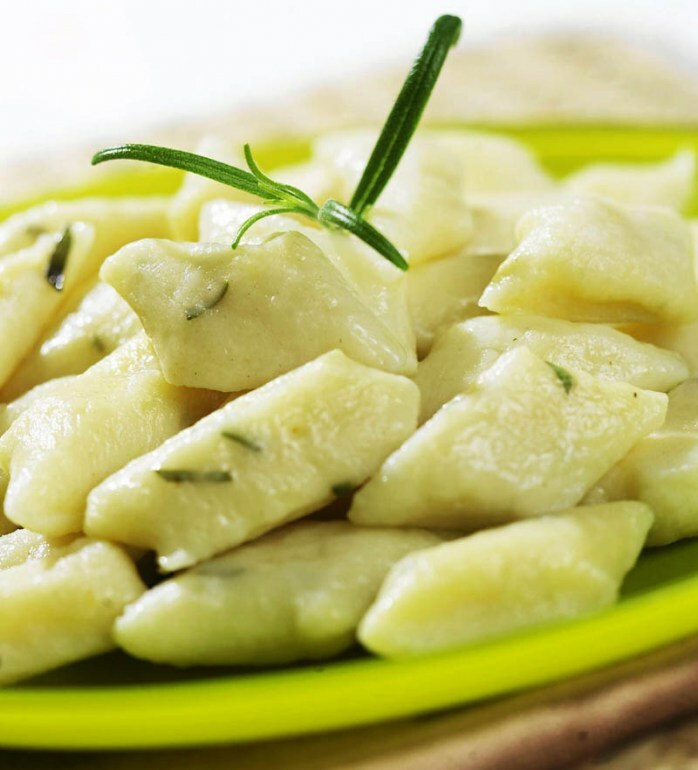 Kopytka are the other evergreen of traditional Polish cuisine, and they can well be compared to the Italian gnocchi. They are made with boiled, mashed potatoes with the addition of flour. Little rolls of dough are used to make up longish kluski, which are then flattened and cooked in boiling water. Kopytka are consumed as the main course, either with a wild mushroom sauce or with as a side dish with all kinds of meats and goulashes. And, much like the leniwe, although kopytka are served in nearly every restaurant serving Polish food, they are also a graceful topic for new culinary interpretations. Poured batter is also known as poured kluski ("lane", pronounced: lah-neh in Polish) and is a popular ingredient of numerous soups, often used instead of rice and noodles—a frequent element of many of the soups popular in Poland. It is very quick to make. 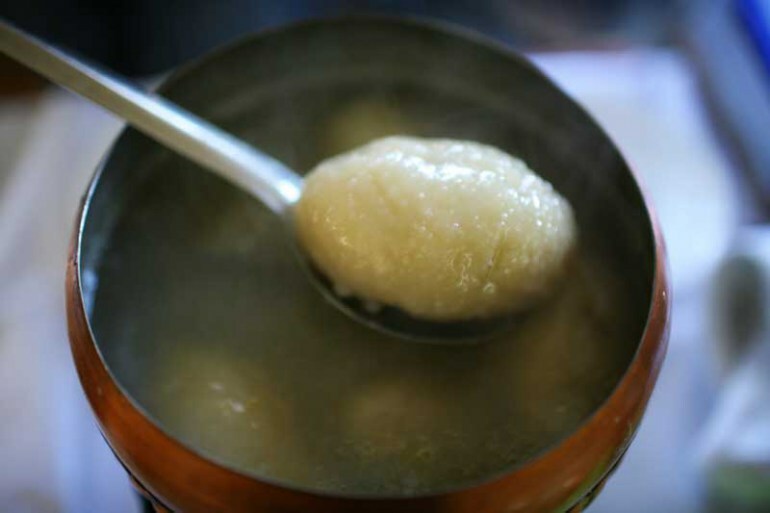 A thin stream of the thick yet flowing dough is poured into a boiling soup either through a fork or a spoon, which occasionally stop the flow, and thus different sized little kluski are formed. The name of the laid, or kładzione, kluski derives from the fact that batter is laid onto a spoon, and only then placed in the boiling water. Kładzione can be made using dough that is made with flour, potatoes, and even cheese. They are served savoury and sweet, as a side serving for meat dishes, or with fruit. 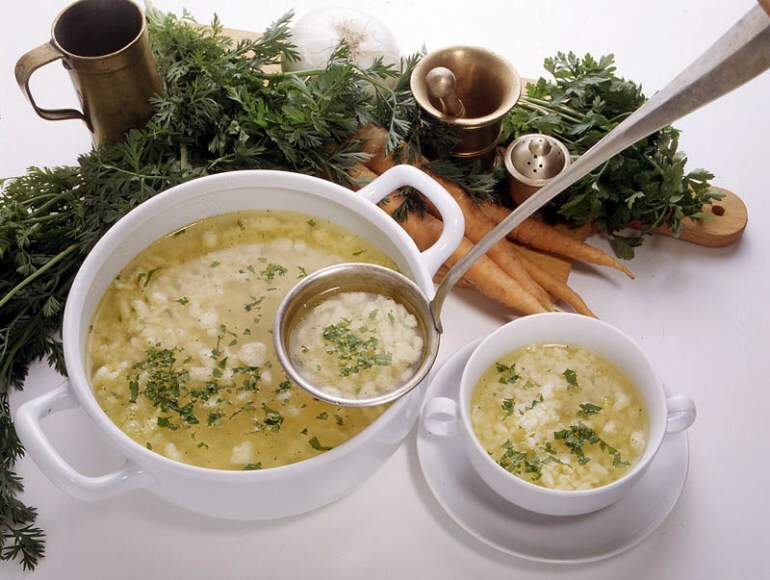 If the kładzione are small, they can also end up in a soup—such as chicken broth.